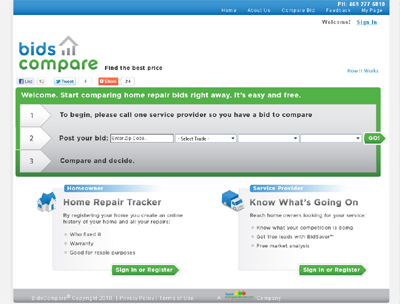 Bids Compare is a user-generated web site enabling homeowners to compare bids on residential service quotes. When using the site homeowners see the price others have been quoted in their neighborhood on exact jobs, giving them insight into the local market, which in turn should save money and give peace of mind. We compare bids in an exact “apples to apples” way, using easy to use drop down menus. Unlike most sites which compare reputations (i.e. yelp, angies list) or “industry averages” we compare exact quotes by zip code.